A terrarium is a small enclosed or open container, usually glass, that contains a variety of small plants and/or creatures. It is typically created as a small representation of an ecosystem.Terrariums can be assembled to create miniature tropic, desert, or temperate environments. 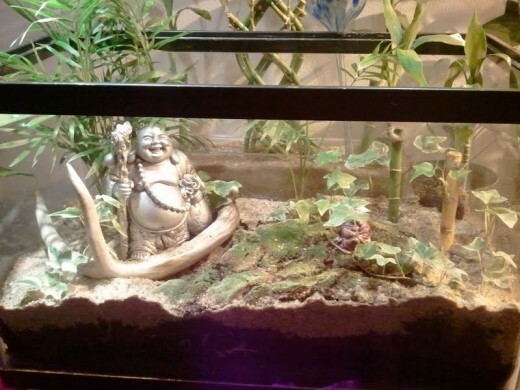 Creatures such as reptiles or insects can live in a terrarium if prepared and maintained properly. Completely enclosed containers are able to maintain humidity and create a tropical environment if desired. Containers that are semi-enclosed or have large openings can be used, but watering and care must occur more often. Containers with large openings allow arranging plants easier but lose humidity quicker compared to enclosed containers. The most important piece of a terrarium is the container. The container needs to be transparent glass or plastic that is leak-proof. An unused aquarium or fish bowl are suitable to use. 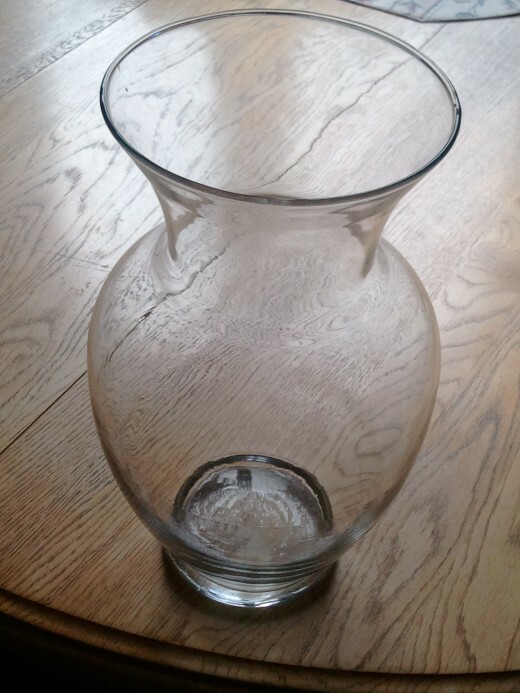 Apothecary jars are commonly used due to the attractive shapes of the jars. Just about any container with an opening large enough for plants to fit into will do fine. The container must be leak-proof as well. Remember, the size of the jar determines what plants can live inside. A 10 gallon aquarium will have much more room, soil, and drainage compared to a Mason jar. Future growth of the plants need to be taken into consideration. There are a few common materials needed to begin building a terrarium once the container has been selected. These materials can be found around the home or at any garden center. Stones - A mixture of small and large stones facilitate drainage. Activated Charcoal - This helps filter and keep the air and water fresh. This is very beneficial in small terrariums. Sphagnum Moss/Landscaping Cloth - Long fiber sphagnum moss is preferred over landscaping cloth, but both help drainage and prevent soil from falling into the stone drainage layer. Plants - An obvious material, but be sure to use plants that do not grow quickly and remain relatively small depending on the size of the terrarium. Potting Soil - The typical garden center potting soil will suffice. 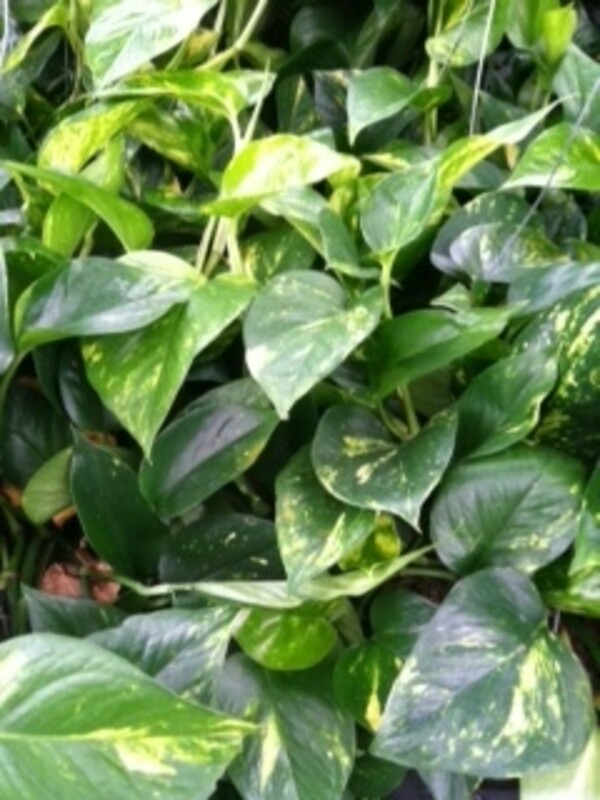 Potting soil sold in garden centers is sterile and will not contain pathogens and bacteria. Using fertile soil from a garden will work as well, but sterilizing the soil should be done before using. 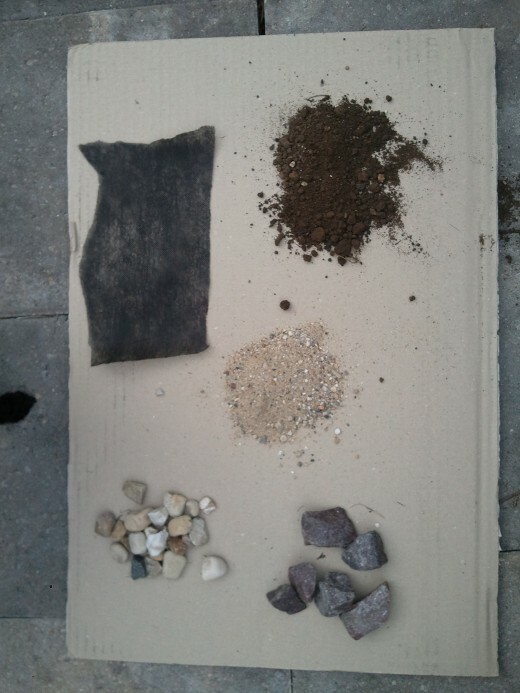 Sand/Aquarium Rock - These can be used for aesthetic purposes to cover up bare soil. Both are not necessary, but they add a little diversity to the terrarium. Ornaments/Decorations - Anything that suits the terrarium can be added. Little figurines, trinkets, etc. A terrarium is composed of layers to promote drainage and maintain humidity. 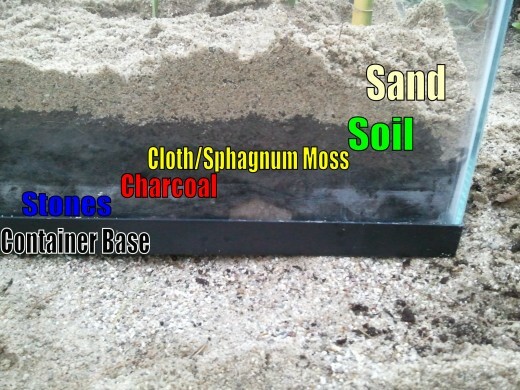 The bottom most layers allow drainage, while the soil and sand layers contain the media for the plants to grow in. Activated charcoal should be added to containers that have small openings, like a bottle or jar. The charcoal helps filter air and water within the terrarium. Large open top containers do not need activated charcoal, but adding some for extra filtration will not harm anything. Gently place about an inch of stones in the bottom of your terrarium. Pour a thin layer of activated charcoal on top the stones if using a small container, like a bottle or jar. Place sphagnum moss or landscaping fabric over the stones. This will facilitate drainage by preventing dirt from filling in the voids between the stones. Pour another thin layer of activated charcoal. This is optional, but will add a little more filtration. Fill the container about one third to one half full of potting soil. Arrange plants in the terrarium. Move this arrangement around until desired arrangement is met. Arrange plants in odd numbers. Odd numbers help the terrarium "blend" together. Pour a little more soil into the container and gently tamp it down so it is firm and the plants are supported. Add sand or aquarium rock on top the soil for a little aesthetic appeal. Water with an adequate amount of water. 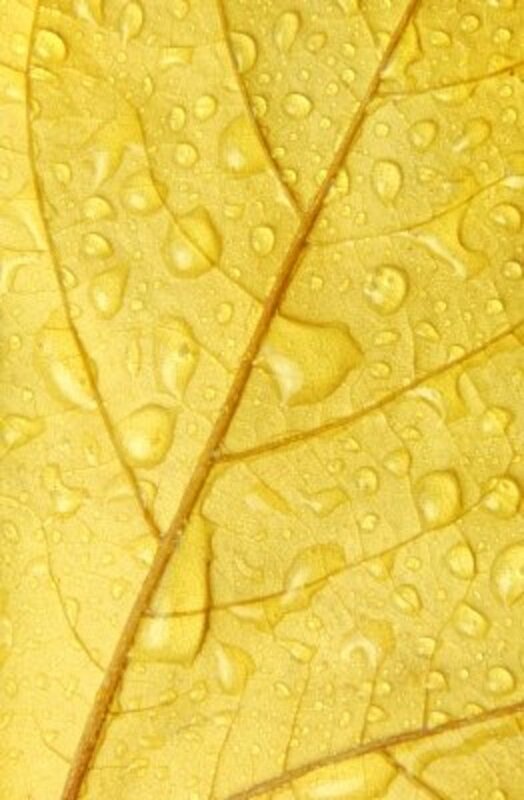 Water enough to moisten all the soil, but do not cause the soil to be waterlogged. Put the terrarium in a place with moderate sunlight. There are many, many plants in the world that can be used and a little research is all that is needed to figure out what plants are suitable for a terrarium. The key to watering a terrarium is preventing over-watering. A terrarium is better off being a little on the dry side than wet. Enclosed terrariums can go months without being watered. Terrariums can go long periods without being watered due to a mini ecosystem in the container. Water will turn to vapor, then condense on the sides of the container and drip back into the soil. Water when there is no condensation collecting. Do not let water stand in the bottom of the terrarium. Water that lies in the bottom is stagnant and needs to be drained. It will only promote diseases like root rot and mold. 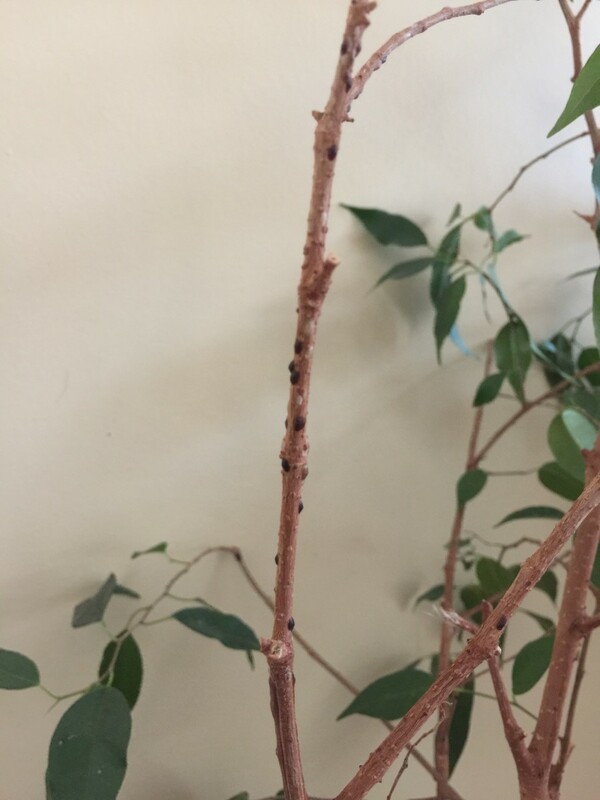 Root rot injures and kills plants if left unchecked. A successful terrarium can sometimes cause plants to grow quicker than desired. Trimming plants before they get too large is important. Pruning prevents overcrowding and keeps the terrarium tidy. Snipping off dead or dying leaves will keep the terrarium looking nice as well. Applying fertilizer to a terrarium is generally discouraged. Fertilizer will boost plant growth and the plants may quickly outgrow the terrarium container. Fertilizers also add salt into the soil and enough salt buildup will harm and kill plants. If plant growth has stopped and discoloration has occurred after 10 to 12 months, then some balanced, water-soluble houseplant fertilizer. The amount of fertilizer used should be about 1/4 the amount listed on the fertilizer package. Using a quarter of the recommended amount will prevent excess fertilization and salt buildup. Going to use this hub when we start our own terrarium. Thanks so much for the guidance! How beautiful and interesting and special! Thanks again for wonderful hub.